The World Conference against Racism, Racial Discrimination, Xenophobia and Related Intolerance (WCAR) finally ended with the release of the conference declaration and programme of action on December 31, 2001 - more than three months after the actual conference closed in Durban. The conference, the last in the series of world conferences in the 20th century organized by the United Nations, was both significant and controversial. It followed the same format as in the previous world conferences of parallel NGO and inter-governmental meetings. The international press reported on the controversies relating to the Palestine-Israel and the African slavery issues. For the peoples in Asia who are discriminated by caste and caste-like systems, the more than 200-paragraph intergovernmental conference declaration and programme of action still missed out their issue. "[D]iscrimination based on work and descent" is not mentioned in the final intergovernmental conference document. Asian NGOs have lobbied for its inclusion since the beginning of the preparatory process of the conference. This issue includes the caste discrimination in India and Nepal, and the Buraku discrimination in Japan. It is believed that the strong objection by the Indian government to the inclusion of the issue is one factor for this omission. The NGO declaration, on the other hand, explains the problem of caste-based discrimination by citing the number of people affected, the nature of suffering endured by them, the means by which discrimination is perpetuated, and the inadequacies of the legal system in protecting their rights. Dalits (people from discriminated-against caste) from South Asia, the representatives of Buraku communities in Japan, and several international NGOs formed an international network and appealed the issue in various occasions starting with the preparatory meetings of the conference. 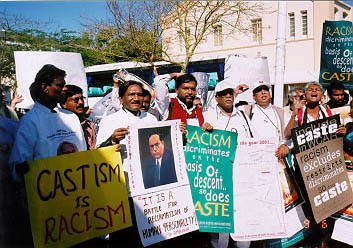 Dalit groups in India mobilized about two hundred people to Durban and strongly appealed for an end to what they call the "hidden Apartheid." Their demonstrations during the NGO Forum drew much attention. The international network continued its lobby during the intergovernmental conference. The declaration and programme of action of the NGO Forum strongly raise the voices of the victims of discrimination as well as the earnest appeal of people fighting against discrimination on the ground. On the other hand, the document of the intergovernmental conference reflects the compromises of State governments. Many more paragraphs in the draft intergovernmental document were not included in the final document due to lack of time. But it nevertheless covered many issues ranging from issues concerning Africans and people of African descent, indigenous peoples, migrants, and refugees as victims of discrimination. The world conference started with a two-day Youth Forum. After which, the NGO Forum began. About ten thousand people working on various discrimination issues attended the NGO Forum. Twenty five thematic commissions were formed to draft statements on specific issues. NGOs held for five days various workshops, symposiums, exhibitions, demonstrations, cultural events, among other activities, touching on diverse issues. They strengthened their networks and cooperated in lobbying in the intergovernmental conference. About two thousand three hundred government representatives from one hundred sixty-three countries attended the intergovernmental conference. About four thousand NGO representatives were also in attendance. Representatives of governments in African and Caribbean countries faced off with their counterparts in the former colonial powers on the issue of reparation for the damage brought by colonialism and slavery. The final document of the intergovernmental conference will be meaningless unless it is translated into action. State governments and UN-related bodies are expected to sincerely implement the conference's programme of action. Civil society including NGOs should urge, and monitor, government action. Kazuhiro Kawamoto, a staff member of HURIGHTS OSAKA, attended the NGO Forum and the intergovernmental conference.